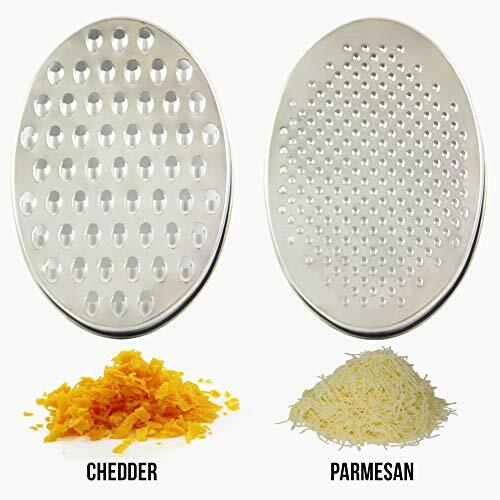 GRATE ALL TYPES OF CHEESE - Recently been voted best cheese grater. Try it with Parmesan, Cheddar, Monterey Jack, Wisconsin, Bergenost, Colby-Jack, Edam, Locatelli, Liederkranz, Muenster and more. 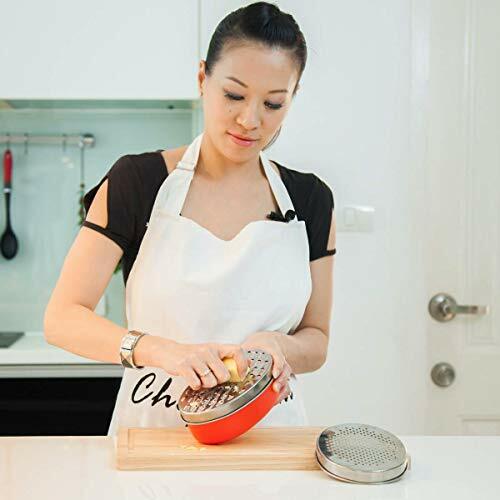 RAZOR SHARP STAINLESS STEEL BLADES - Professional quality kitchen utensil that makes light work of food prep for everyone. Fine and coarse grates will cut through food like a knife. Our customers also grate cucumber, cabbage, carrots, cauliflower, onion, potato, zucchini and other vegetables. AIRTIGHT STORAGE CONTAINER & SUPER EASY TO CLEAN - It comes with attachable container base to hold food for mess-free grating, with securely fitting snap on lid. Dishwasher safe, or easily washed with soap and water. 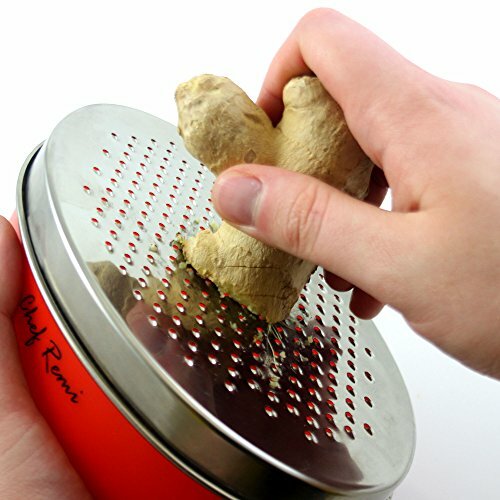 FINE GRINDER: Our fine grater is ideal for orange, lemon, other citrus fruits, apple, coconut, chocolate, bread, almonds, nuts, ginger, garlic, cinnamon, and other spices and herbs. 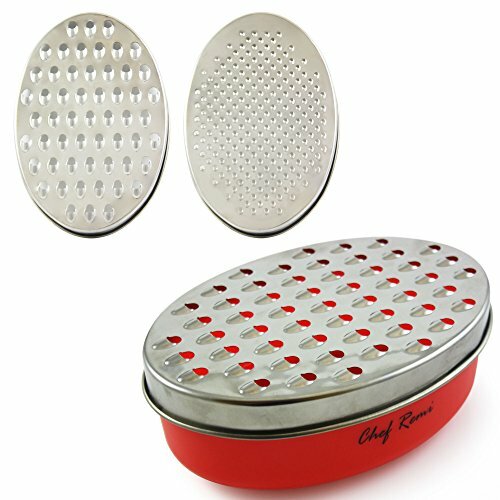 LIFETIME GUARANTEE - The Chef Remi Cheese Grater comes with a 100% Money Back Lifetime Guarantee. You won't get this lifetime guarantee from other big brands. Try It RISK FREE Today! Chef Remi believes that families are the centrepiece of society and communities are stronger when they sit down together even if it's over a quick, wholesome meal. Our company is 100% committed to designing genuine quality kitchen tools to support busy parents that take the time to cook for their family, because every child deserves a home cooked meal with a family who loves them. 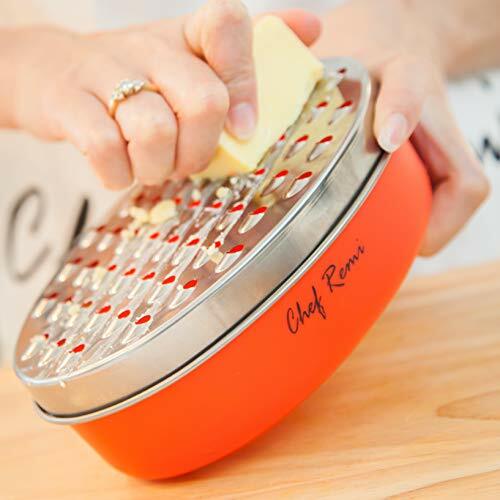 A must-have for any busy household, the Chef Remi professional quality food and cheese grater offers the complete solution to grating, shredding and zesting your favourite cheeses, vegetables, herbs and spices. This versatile equipment is the go-to utensil for getting meal prep done at record speed. Enjoy recipes such as pizazz, quesadillas, welsh rarebit, tacos, nachos and various sauces fast. 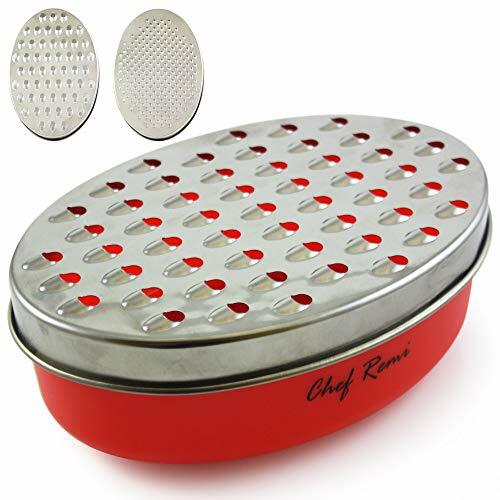 Equipped with reliable, razor sharp, stainless-steel grates, and a non-slip bottom, this premium kitchen grater will quickly shred, grate and grind. Efficiently stores all grated foods instantly in container bottom for no mess. Comes with a secure, snap on lid so you can directly store foods in fridge, cupboard etc. 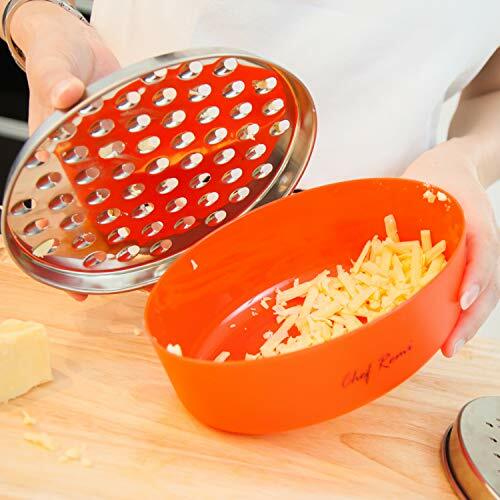 Never accidentally grate your knuckles again on a box grater, or change between many different grates, this easy-to-use equipment will soon become a family favourite. Chef Remi Design, Chef Remi Crafted.- WHEN QUALITY MATTERS! We offer a LIFETIME GUARANTEE not like our competitors. Try us, RISK FREE!